Dr. Hauschka Moisturisers each have their own leading plant, which gives them their distinctive character, as individual as your skin. The philosophical approach behind Dr. Hauschka Skin Care is Anthroposophy, meaning ‘wisdom of man/woman’. Philosopher and natural scientist Dr. Rudolf Steiner’s work is not for the faint hearted, however, it’s interesting to have an understanding of how this relates to the development of product formulations and the efficacy of Dr. Hauschka Skin Care preparations. Through close observation of plants in their natural environments Steiner explored the relationship between plants and people. His work revealed the healing qualities of specific plants and showed how each of their three parts is symbiotic with the human body and skin; the body’s largest organ. This concept he named ‘three-fold’. According to the three-fold image, the human being is made up of three core systems: the nerve-sense, the rhythmic and the metabolic-limb. Like humans, plants have their own three-fold system. For a plant, however, the system is turned upside down. While in a human the nerve-sense system is found in the head, in a plant, it’s in the roots, the other way around. The metabolic-limb system is at the top of a plant in its flowers, fruits and seeds. At the centre of a plant, the stem and leaves is the rhythmic system. Skin has three layers; the epidermis (top layer), dermis (mid layer) and subcutaneous or hypodermis (3rd and deepest layer). You would have heard of the term ‘third degree burns’, meaning all three layers of the skin. Real health and beauty come from the inside and the outside. In its natural state, the skin is healthy and balanced. However skin condition can easily be compromised when other factors come into play; such as internal and external environmental issues, lifestyle, hormonal issues, transitions or stress. Peace of mind is beneficial for the skin as is adequate sleep, nutritious food, fresh air and exercise. Negative effects on the skin may result in acne/blemishes, inflammation, dry and/or dehydrated skin, premature wrinkles or simply a complexion that lacks health and radiance. At this point the natural world helps to heal. How this relates to Dr. Hauschka Skin Care is understanding the remarkable similarities between plants and the skin, so we are able to select ingredients that support particular skin functions. We can take Rosemary as an example of how we look at a medicinal plant ingredient. Rosemary has few flowers, and an abundance of leaves. The leaves are the plant’s rhythmic system. We look at the effect Rosemary has on our rhythmic system: enhancing circulation, warming and invigorating. Dr.Hauschka Skin Care preparations contain elements of plant root, leaf and flower, so all three layers of skin are addressed. Our preparations are developed by Anthroposophically Trained Doctors and Pharmacists in conjunction with our highly qualified Dr. Hauschka trained Estheticians. Our formulations are complex and they comprise of many elements, never one or two. 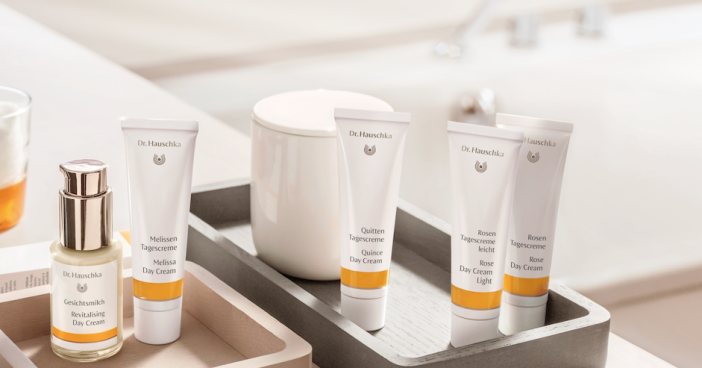 Every ingredient that goes into a Dr. Hauschka Skin Care product has an important job to do for your skin. Whether delivering essential moisture, encouraging resilience, nourishment, protection from the environment, improving efficacy or something for the senses as well as your skin in the form of essential oils. Each element is thoughtfully selected for its particular effects and its interaction with the other ingredients in the formula. *WALA and Dr. Hauschka Skin Care have been working with healing plant and mineral extracts since the 1930’s. This pharmaceutical and medicinal expertise joins over 45 years of pioneering work in truly holistic skin care to create the purest, most effective natural, organic and biodynamic skin care products available. *WALA produces Dr. Hauschka skin care and make-up and WALA anthroposophical homeopathic remedies.